David, Patron of Wales', monastery had a most austere regime. Instead of oxen to pull the plough, the monks had to pull their plough on their own shoulders. 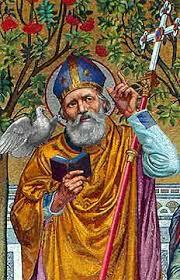 Summary of St David, Bishop David is the patron saint of Wales, where he was an abbot and bishop in the sixth century. He is reputed to have founded a number of monasteries, of strict regime. Several Irish saints were his pupils, and he seems to have influenced monastic development in Ireland. He died about 601, but he continued to be remembered in Ireland, and he is mentioned in the Martyrology of Oengus and in the Catalogue of the Sts of Ireland. 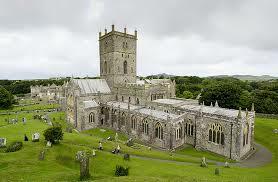 St David is patron of Wales, where he was abbot and bishop in the sixth century. Several Irish saints were his pupils and he influenced monastic developement in Ireland. Accounts of David’s life are based on oral tradition and a ‘Life’ written by Rhygyfarch (11th century bishop of St David’s) at a time when the Norman bishop of Canterbury Lanfranc was trying to impose Roman dedications on churches in England and Wales. Rhygyfarch was keen to impress on the recently arrived leaders the importance of the Welsh saint and was not above a little exaggeration. Patrick Duffy presents the tradition about David. The tradition is that David was born at Henvynyw (Vetus-Menevia) in Cardiganshire, that his father was a prince called Sant who violated his mother, a nun (called Non). Rhygyfarch, who lived from 1057-1099 and wrote a Life of David in Latin to impress the Normans, called him Sant ‘holy’ (sanctus by name and by merit), glossing over the alleged violation. David is said to have been baptised by Ailbe, ‘a bishop of the Munstermen’, who is known to have been in Wales about that time. David studied at the local monastic school and after he was ordained priest, he went to study under Paulinus of Wales near the Brecon Beacons. He remained with Paulinus for several years and is said to have cured him of blindness. Paulinus sent David out to make his own monastic foundations. Rhygyfarch says David founded monasteries at Glastonbury, Bath and Leominster, but these are more likely to be Rhygyfarch’s own claims to impress the Normans. But the one monastery we know he founded was that of Mynyw (Menevia) near his own birth place on the extreme south west of South Wales, facing Ireland, and now called St David’s. The monastery had a most austere regime. Instead of oxen to pull the plough, the monks had to pull their plough on their own shoulders. The diet was strict – consisting of bread, bitter herbs and salt with water or a little milk. David was called Aquaticus, because he drank only water and his monks became known as the Aquatici or “watermen”. Finian of Clonard and Modhomhnoc (see 13th February) both spent time at his monastery. When the Pelagian heresy was being discussed at the Synod of Brevi (Llandewi Brefi in Cardiganshire), David was summoned to resolve the dispute. Shortly afterwards, in 569, he presided over another synod held at a place called Lucus Victoriae. Rhygyfarch says David went to the Holy Land with two other Welsh monks Teilo and Padarn and that he was consecrated archbishop of Wales by the patriarch of Jerusalem – probably another exaggeration! He was bishop (probably not archbishop) of Menevia, the Roman port of Menapia in Pembrokeshire, later known as St. David’s, then the chief point of departure for Ireland. He died around 601. The cult of St. David was approved by Pope Callistus II in the year 1120 and two pilgrimages to St David’s were declared to be equal in merit to one pilgrimage to Rome. The Catholic diocese of that area of Wales is still called Menevia; the bishop currently lives in Swansea.